Having finished my second year of university in a whirlwind of exams and deadlines, I was struck by the fact that I suddenly four months of absolutely nothing staring me in the face. To some this would sound like heaven but to me this is my idea of absolute hell. Even after just one week at being home I was ready to climb the walls and was going stir crazy. So this summer, I decided to do something a little different; I spent my break as an English teacher in Ambalangoda, Sri Lanka. I planned my trip through Plan My Gap Year; a company I would truly recommend to anyone thinking of volunteering. The build-up and preparations for two months in Sri Lanka could not have gone smoother than with the help of the admin team at PMGY and before I knew it I was standing at Heathrow airport, waiting to board the plane. I arrived in Sri Lanka at five in the morning and I can’t really tell you of my first impressions of Sri Lanka as I was asleep for most of it! However, when I reached the volunteer house I was greeted at the front door by our host mother, Tharmari and a flower necklace and my first thought was “I think I’m going like this place”. I wasn’t wrong; Sri Lanka is by far one of the most beautiful and exciting places I’ve ever seen. The people are so lovely and chilled out and the food (or at least Tharmari’s cooking) was absolutely incredible. Being an Island, Sri Lanka is home to some absolutely stunning coast line, in fact when I wasn’t educating children, I spent most weekends sunning myself on the beach. Unawatuna and Marissa beach were firm favourites of the volunteers; with their sandy beaches and warm water both places proved to be great weekend breaks. Marissa, was my personal favourite as the waves there were crazy high and I had great fun being wiped out in the surf. Aragum Bay, despite being a six hour journey from Ambalangoda, also deserves a mention as its stunning coastline and chilled out atmosphere gives it a much deserved reputation of being a surfer’s paradise. Of course Sri Lanka is not all about the beaches and the food (although that’s a predominant part), it’s also home to some fantastic wildlife. 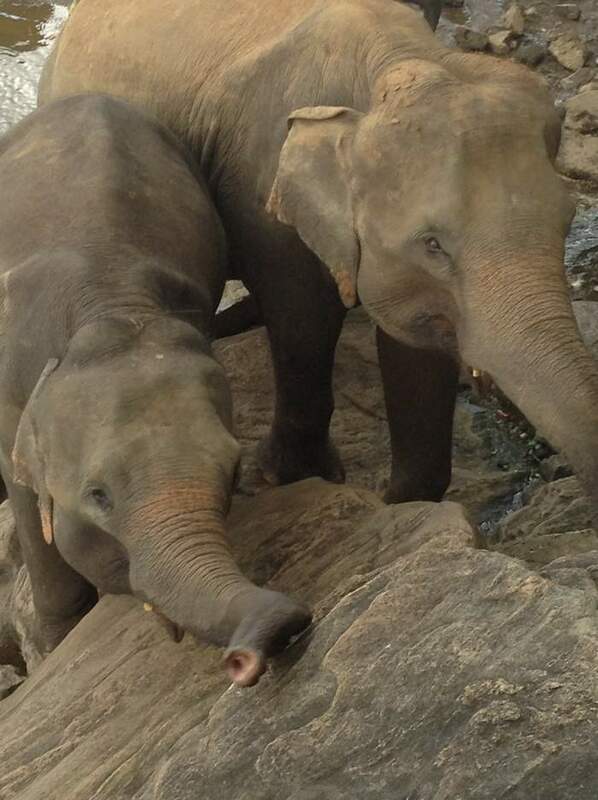 One weekend, our volunteer group made a trip down to Adam’s Peak and Yala National Park. Adam’s peak, as the highest point in Sri Lanka is supposed to be home to Sri Lanka’s best view. I’m sure it is but unfortunately I can’t comment on this as we stupidly climbed to the top in torrential rain and saw absolutely nothing. Yala, however was well worth the drive in a cramped mini-van as its home to a huge number of exotic wildlife, including crocodiles, exotic birds, water buffalo and elephants. Other highlights from the Sri Lanka trip, include Kandy and the Kandian dancers, who are absolutely incredible and well worth a watch, and the elephant orphanage at Pennewala. 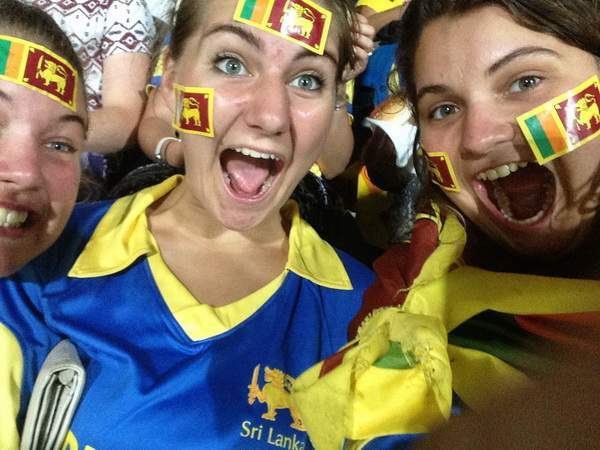 The icing on the cake, however, as far I am concerned was getting to see Sri Lanka play South Africa at cricket; you can’t come to Sri Lanka and not be involved in cricket at some point, it’s just not possible. So to be able to see an international match and meet the captain afterwards was an absolute once in a lifetime opportunity for me. However enough about the social aspects, I must now include some information about my volunteer experiences in Sri Lanka. During the week, I worked in both a government primary school and teaching project for children whose families were affected by the 2004 Tsunami. In the morning from 7.30 till 1.30 I taught school children from grade 2 up until grade 5, it was a huge shock for me as the classrooms were tiny and I had anything up to fifty children in on class. Let’s just say it was a huge challenge! However through lots of games, repetition, pictures and actions, I feel confident that the children came away with improved English and a greater level of confidence. The boys certainly had no problem telling me how bad my bowling was when it came to playing cricket at interval! I was incredibly sad to leave the school at the end of 7 weeks, and all the students and staff made it even worse by throwing me a huge party and showering me with presents. My other task, the Tsunami project was arguably my preferred project, as over the course of eight weeks I was given the lead responsibility of a group of fifteen, six to ten year olds. Because I saw these children every day from 3 till 6, I formed close bonds with all of them. Being such young children, I definitely had an uphill struggle with a rowdy bunch of kids, who just wanted to play all the time. In addition to this, at the start of the program, only half of my children knew the alphabet and those that did got easily confused, so knowing I had to start teaching the English language completely from scratch, it seemed like I had my work cut out for me. However this was a blessing in disguise because having to start from the beginning meant that I was able to see just how much progress each child made. I can honestly say that meeting and teaching this group of children has been the biggest honour and privilege of my life so far. I came to love each individual child, and I was absolutely heartbroken when I had to leave. I definitely feel that this whole experience has also taught me a lot about myself, and after coming home I feel increasingly confident within myself. Before I finish this long winded ramblings (for which I apologise) I must take a minute to mention the family I stayed with in Sri Lanka. Ashika and his family are some of the nicest people I have ever met. They welcomed each and every volunteer into their home, treated us like family and definitely made being away from home for a long period of time an easier process. At times it felt as though Ashika and his family would bend over backwards to ensure that all the volunteers were happy and satisfied with the program. I just want to thank them for everything they did for me. If you are thinking of volunteering; do it! It’s such a rewarding process, and you should definitely keep in mind PMGY as a potential company!